List: Cloud strategies take shape for some of the biggest players in the cloud industry. The cloud industry rarely seems to have a quiet week as constant innovation, collaborations and strategic moves on a near-constant basis hit the headlines. Another week has gone by where this rings true as IBM made a major acquisition, Microsoft held its Build conference and Intel laid out plans to be the standard in the cloud industry. CBR has compiled a synopsis of the major news from this week with analysis of what it all means below. A trend has emerged over the past year of consulting firms buying specialists that work with Salesforce, with IBM continuing this trend with the acquisition of Bluewolf Group. Bluewolf is a consulting company that specialises in helping businesses to use Salesforce, in addition to other cloud software applications. The consulting firm is expected to be bought for around $200m and will be added to Big Blue’s Interactive Experience unit of its global services arm. The appeal of buying a consulting company that specialises in Salesforce is that it has become a core component in many businesses digital transformation. So the closer that IBM can be to that, the more business it is likely to get. IBM’s CEO Ginni Rometty has been busy transitioning IBM from a hardware specialist into one that also specialises in business software and services. Acquisitions of cloud video hosting service UStream and that of the Weather Company highlight this. Moving IBM closer to Salesforce is unlikely to be seen as a bad strategy considering the strength of the CRM provider. Last year there were rumours flying around that someone might be looking to buy Salesforce, could IBM be in the market for a major acquisition? Intel’s business received a huge boost when the likes of AWS took off, suddenly there was a huge increase in demand for Intel’s chips and servers, something that Intel is keen to prolong. With this in mind, Intel has expanded its Xeon line with new models that are designed to boost computing performance. It has also announced collaborations with CoreOS and Mirantis, both with the idea of simplifying choices for cloud operators in order to accelerate the adoption of cloud solutions. Further collaborative work is being done with VMware to produce centres of excellence that will build reference patterns for cloud deployments. Work with the Cloud Native Computing Foundation will see the two work together to set up 1,000 server nodes so that developers can run apps for test before deployment. A final piece of work is being done in the cloud by Intel which will see it expand its Cloud Builders program by adding storage functions. All of these moves make perfect sense and it highlights that Intel has a clear plan when it comes to cloud. The company wants to get developers on board early with its servers running the cloud providers that they use. Intel wants a mature OpenStack, again so more people adopt it and more of Intel’s servers and chips are needed, so working closely with companies in the OpenStack community to help them mature makes sense. Finally a move to standardise cloud to make it even simpler to use, makes sense for Intel, especially when it is putting itself as the standard for chips and server use. 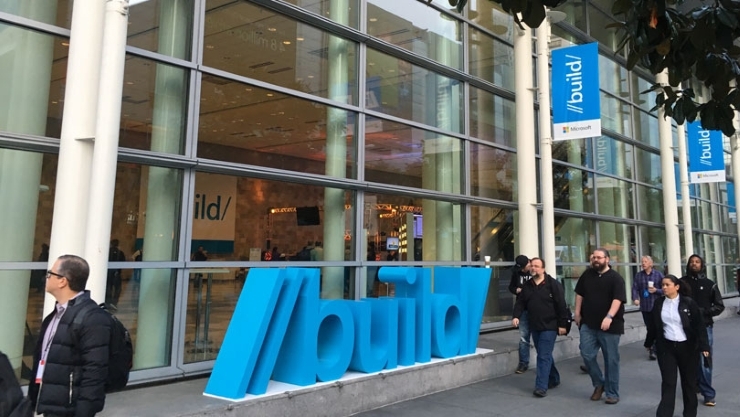 On day two of Microsoft’s developer conference, Build 2016, the company focused on demonstrating how its Azure cloud service and Office platform can be put to use by developers to use advanced analytics, machine learning, and the Inter of Things to build intelligent apps. Several services were revealed including a preview of Azure Functions, a service that extends the platform to let developers handle tasks that respond to events common in Web and mobile applications, IoT and big data. A preview of Power BI Embedded, a service that allows developers to embed fully interactive reports and visualisations in any application, on any device, was also revealed. In addition to this, the company was joined on stage by BMW, which launched its Connected mobile app that uses Microsoft’s database and machine learning services to keep tabs on traffic conditions and other elements. The real talking point of this is that BMW is an AWS customer; although it is still using AWS it shows a growing trend for major businesses to diversify their cloud services. Microsoft’s moves aren’t surprising ones. It wants more and more developers to be using the Azure platform and by giving them more capabilities the idea is that they will be more inclined to join. However, the problem is that they aren’t the only company doing it and only tools and services that are totally unique to them are likely to be a major draw. While ScaleIO is not a cloud product, the software-defined Block storage has been updated with cloud in mind. New features are designed to meet the growing requirements of large companies in sectors like banking and telecoms. ScaleIO 2.0 will support new OS platforms and includes expanded OpenStack capabilities in what forms part of EMC’s ongoing private and hybrid cloud strategy. ScaleIO is basically designed to add enterprise storage features to direct attached storage, which is meant to allow for easy upgrades. David Noy, EMC’s VP of product management for emerging technologies, said that the system is becoming popular with customers that are building out public clouds to compete with Amazon, large enterprises building private cloud with Amazon-like features, and large financial services firms that want to build block storage on commodity hardware. It seems that every piece of technology is to have some cloud capabilities and EMC’s decision to play to this fits into that mould. EMC has identified some trends in the market that suggest it should be offering ScaleIO in a way that its customers are accustomed to, that being that it is similar to what Amazon has built but not quite it. Creating an offering that is playing nicely with the largest public cloud vendor isn’t a bad way to go as familiarity with a technology style often being a factor behind making decisions of whether to adopt or not. Never one to miss out on an opportunity to cloudify something, Google has decided that it wants to make landlines relevant again by introducing a Fiber phone. The Fiber Phone is a cloud-based phone number that can be used on almost any phone, tablet or laptop. Google Fiber product manager John Shriver-Blake in a blog said: "Fiber Phone can help you make the most of your home phone — even when you’re not at home. Adding Fiber Phone means getting access on the road, in the office, or wherever you are." This basically makes it sound like a mobile phone, but it isn’t, although it is a landline that you can essentially take with you…similarly but not quite like a mobile. Google Fiber was launched in 2012 and currently has services available in four cities in the US including Kansas City, Atlanta, Austin and Provo. Fiber services are expected to be introduced in another seven cities in the coming months. Is there anything that can’t be made into a cloud product? Probably, but that won’t stop companies like Google trying. The advantage that Google has is that it can try pretty much anything and because it makes so much money it doesn’t matter if it doesn’t work out, unless of course it’s something absolutely massive that falls flat. Google’s opportunity though is to try and capitalise on a market that has mainly been vacated to some extent by telecom operators that are shifting their focus to Internet content services. The cloud industry continues to rumble along in a way that means pretty much no industry will avoid disruption. The choice for vendors is simple, get on-board the cloud train or suffer. The choice is the same for businesses given the competitive advantage that cloud provides. Intel and Microsoft know exactly what they are doing with their product announcements and strategic moves, while IBM looks to be increasingly figuring out a cloud strategy that puts it in close contact with developers and the leading players. EMC’s move feels a little bit more forced, adding cloud capabilities that may have long been requested but something the technology could live without. EMC has decided to make this move in order to appease customer demands for these capabilities and it is one that should provide a little more longevity to the product. Google meanwhile will do what Google does, experiment and disrupt, not everything will gain mass adoption but enough of it sticks to make the company one of the most innovative in the world.